Rediff.com » Movies » When Vikram picked up Abhishek and threw him! His actual name is Kenny, but Vikram is the name he gave himself. Everybody knows him as a Southern acting legend, but not many know he is a playback singer. Not only has he sung his songs, but he is also singing for other actors. 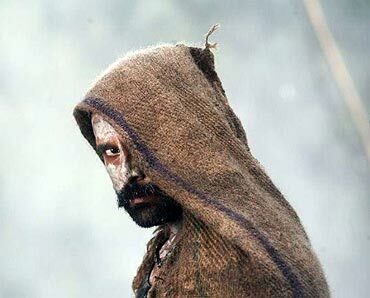 This multi-talented actor plays Dev in Raavan and Veera in Raavanan, the Tamil version. He tells Patcy N what it was like working with Mani Ratnam, Aishwarya Rai and Abhishek Bachchan. This is your first film with Mani Ratnam. How did he approach you? Over the last four or five years, Mani and I have tried working with each other on two or three films. But every time there was some problem and things were not falling in place. This time when we met up, Mani narrated this fantastic script and I got really excited about the character. I did not have the dates but I pushed everything aside and took this opportunity as I was dying to work with him. It is every actor's dream to work with Mani Ratnam at least once in a lifetime. When did he ask you to do the Hindi version? He asked me to think about it. He told me they were two completely different roles and that it would be challenging for both of us. Then I told him let's do it. His confidence in me moved me. Later, while doing it, and now, going by the response we are getting I think it was a wise decision. Getting to do a single Mani Ratnam film is a dream come true, but I got to do three films with him in one go -- Raavan in Hindi, Raavanan in Tamil and Villain in Telugu, which is a dubbed version of the Tamil movie. How did you overcome your fear? How difficult was it to dub in Hindi? Fear came later. I was so blank when he gave me that offer I thought he was joking. My dates were also not available because he shifted his schedule and I thought that again this film would not work out. But now I wanted to do it desperately because I loved the script, but somehow everything worked out. I thought if Aishwarya, who does not know Tamil, is doing the role then why can't I. Even Mani Sir told me the same. But Tamil is an easier language than Hindi. Hindi is very difficult for a south Indian. Dubbing my Hindi lines was the equivalent of giving birth to a child. It was very difficult because our language, Tamil, is very basic. We don't have barakhadi. I think one of the most difficult things in my life was dubbing in Hindi. I definitely wouldn't have done it without Karan Kashyap, my Hindi instructor. He was there all the time. He was a pain and he tortured me just like Mani tortured all of us while shooting. Karan was Mani's smaller version; he is very ruthless. If you don't get a ka or kha right he will make you do it till you get it right. He was so patient even when I dubbed so many times for a single line. But when I see the film I think it sounds so good. If anyone thinks I have done a good job in delivering my dialogue I will have to thank Karan before thanking god. How was it working with Mani Ratnam? You said the right word 'working'. When you do his film, you are actually working. Normally when you do a film you relax. Though the actor's job is difficult, it is still enjoyable. Like I always say I made my hobby my profession and I don't have to work even a day in my life. But when you are doing Mani Sir's film, it becomes work. When we start shooting in the morning, everything is planned and goes according to schedule. Every scene is conceptualised in a way that it is difficult to perform. When you are with Mani, you learn so much about creation, you don't just go there as an actor you become part of it and you want to learn his concept and how he has presented it. It is so interesting that you can't help but want to learn from him. I thought he is like a school in itself; you learn so much from him, whether you like it or not. We were all labourers on the sets; it was like a labour camp, it was like war. There was constant tension on the sets because everything had to be perfect for his frame. We were all working so hard. I am sure Mani Sir's other films are relaxing. When you look at the trailers now, you see that the canvas looks magnificent and perfect because he has planned it that way. In such a set up you cannot relax and joke. How challenging was shooting for two roles? What was the research that went behind the two characters? I started working it in my mind how well I would do the two roles. They are so different from each other. Also, this is my first film in Hindi. I know whatever I do here it will be new for them, but I had to think of my audience down South also. For them I had to make both the roles look different and ensure that they are not like my previous roles. Plus, I wanted people to wonder whether the same guy played Veera and Dev. It was difficult to achieve because both the guys started looking the same because we did not shoot at different times. But then I worked on my body language and my posture. I internalised the characters differently. Anyone who sees Dev alone will like it and think I have done an okay job, but when they see both the characters they will appreciate the effort I have put in. As we were shooting simultaneously, I got 45 minutes to change from one character to the other. Later, there was some scheduling problem, and Mani Sir gave me nine minutes to change my clothes. I do my own make up so it was much more faster. It was hell shooting like that but again it was so challenging. It is not everyday you get to do stuff like this. You have done some awesome stunts in Raavan. Which was the most difficult? Did you get hurt? The most difficult was the fight on the bridge. I had sprained my back and I could not walk. But this fight demanded that I pick up AB (Abhishek Bachchan) and throw him. So that was very tough. But people who have seen the scene tell me it has come out really well. Did Abhishek and you talk to each other about your characters? Abhishek and I are both very opinionated. Both of us have our own views so we both had a fixed idea about what we want to do and how we want to do, and I think both of us realised this is going to be one of the most challenging roles of our life yet. We both had our own interpretation of Beera or Veera. So I don't think I was willing to listen to him or he was willing to listen to me. We both respect and love each other's work so I don't think we had to explain to each other. We were both there in our own zone. Both of us knew that the other was really doing well and you better be on your toes. That was something that egged us on. We knew both the films will be seen and our work will be appreciated for what we have done. There was healthy competition between us. AB is such a good friend of mine and I was happy we were working opposite each other and he felt the same about me. AB has seen my films. He saw Dhool some 17 times and Saami some 20 times and he had mentioned it in the press when he had come to Chennai. He said 'I am Vikram's fan'; I was very moved. Later when he was shooting for my friend Jeeva's movie Run, he was shooting an hour away from my home I went and met him and thanked him. He was shocked to see me and we just started talking and it was like we have always been friends. With AB it is very easy to become a friend as he is a very nice person. So when we worked with each other our friendship just became better. My film Ullhasam was produced by Amitabh Bachchan but we did not meet each other directly. I don't recollect it, but AB told me he was an assistant in the film. In fact I did not meet Mr Bachchan (Amitabh Bachchan) also during that time. It was a joke but I was so honoured as I am so crazy about his work and that he still does it. He is fantastic. I think he is an awesome actor and I love the way he keeps on reinventing himself every time. Look at the body of work he has done, be it Paa or Cheeni Kum. Even his cameo in Bunty Aur Babli is brilliant. I would love to want to be like him. How was working with Aishwarya, You said she was just like another hero on the sets? She was the hero. We all three had equal and performances-oriented roles. She was not like a showpiece because she is the most beautiful woman in the world. She also worked hard. Why I felt she was the hero because every time we were doing a stunt she was there with us doing that stunt which was so risky and plus she was doing the same stunt and same scene twice. We were always worried about each other because there were risky shots. For one of the scenes, she was in the water from morning to evening. She came out only for lunch. The way she approached the scene and did her part was amazing. But we had other heroes too like Mani Ratnam, Santosh Sivan and A R Rahman. You trekked to the shoot every day. What was the whole experience like? It was like going to war. We shot some scenes at Malshej Ghat (in Maharashtra) We would drive there for about an hour then we would get into a jeep and drive for twenty minutes and then we would start walking. We would always shoot at some cliff of a waterfall 3000 feet below. When you see the location you wonder why no one has found it and how this man (Ratnam) finds all this. When you see Orchha (in Madhya Pradesh) you wonder why no one has shot there before. The locations are so exotic; they are beautiful at the same time dangerous. Even when we were shooting at Athirappally Waterfalls we had to walk all the way up and it would take an hour to reach the top. All of us were cursing but we knew Mani Sir was also with us doing the same stuff. What took you so long to make a comeback after Aparichit? Did you get any Bollywood offers? I got about 17 to 18 movies but I wasn't really looking at Bollywood at all. I had my stuff back home and everything was looking good and plus you don't want to venture into terrain you don't know. If you have to succeed here you have to leave everything and come here. So I thought let it happen at a later stage. I do only one film in two years. So I am already doing only a few movies. If I disappear from there to do Hindi films, people will forget me. Did you feel bad that your film Sethu was remade instead of being dubbed? I did not feel bad. It was remade as Tere Naam and Salman (Khan) did a great job. Even though you are actor Vinod Raj's son, it took a long time for you to get your first hit Sethu? I think the right combination and the right script did not happen for me. I think I must have been a bad actor before Sethu [laughs]. I think in Sethu, director Bala kind of woke me up and told me this is what I can do. After that I got confident and realised what I wanted to do, but before that I think so I was doing stupid things and I must be acting stupidly. That definitely must be the reason. I should thank Bala for where I am today. He is one of the best directors in the world. I got a National Award for his film Pihtamagan. The confidence that he shows in you is tremendous. Even if you are very shy and can't act he will make you get awards. I have seen him bring old ladies from our villages who won't even look in their husbands' eyes and make them act. Bala is the one who moulded me. Why do you do one film at a time? You have got just 42 films in 20 years. I used to do lots of movies before but in the last twelve years I have done only eight films. Like I said, I do one movie in two years. I like to take time over each film. After the first Rs 1 lakh, everything else is pocket money. It is not the money that is important. I have to like the role, and I like to work for my role. Plus, when directors take time I don't ask them to hurry up. Now that I have woken up, I tell them lets do films faster. Now I want to do two films a year. Your mother was a deputy collector. Did you never think of getting a government job when you were young? You yourself have an MBA. Did you never think of a 9 to 5 job? No I hated that. I can't do a desk job. I would die. If I had not become an actor I would have become a photographer or an assistant cameraman. I would have done something related to films. I would have sketched. I was in the advertising firm Lintas as a copywriter while I was studying. I never liked it. I am a free spirit. I like to roam. When you act in a film you can be anything that you want to. I don't think I would have survived anywhere else other than films. Will you shift to Mumbai if you get more offers in Bollywood? I won't move to Mumbai. I have half of India under my belt. I don't need to leave everything and come here. But I will definitely do films where the roles are different and challenging. Who are the actors and directors that you want to work with in Bollywood? I like lots of actors. Whether it is Aamir (Khan), Salman (Khan) and Shah Rukh (Khan) and all the super stars, Hrithik (Roshan), AB. You have such fantastic directors like Vishal Bhardwaj, Rajkumar Hirani, and Rakyesh Mehra. When I saw Rang De Basanti I thought why can't we do films like this in Tamil. There are so many good directors here, I loved Farhan Akhtar's Dil Chahta Hai, I thought it was such a new concept, it was hip and peppy. I like lots of stuff that you guys are doing here. I just want to do something different. I will choose the film according to the role, not on whether it is multi-starrer or a solo hero film. Katrina (Kaif) is someone with whom I would love to work with. She is a very good friend of mine. Plus she is the most beautiful woman in India. I would like to work with Vidya Balan and Nandita Das too. They are both really amazing actresses. What they do is so different and intense. Priyanka (Chopra) has suddenly started experimenting with her looks like in What's your Raashee? Forget the film and everything else but you should have guts to do something like that. She tried to do so many roles with so much confidence and she did a great job. I like Kangna Ranaut, she is also trying out stuff and is also interesting. Rani Mukherji is a great actor. I would like to work with her. Ash of course is one of my favourite actresses. I see all the directors that you have and they are fantastic. I would love to work with all of them.